*University of Minnesota; **Boehringer Ingelheim VetMedica Inc. Considering the high replacement rate of breeding herds, and the fact that replacement gilts are usually from Mycoplasma hyopneumoniae negative sources, acclimation measures have to be taken into account when introducing these gilts into endemically infected herds. In this study the ideal seeder‐to‐naïve gilt ratio, or proportion of shedding gilts in a group, was evaluated for successful natural exposure to M. hyopneumoniae. Sixty gilts were divided in two groups, 21 2‐week old seeder gilts, and 39 aged‐matched naïve gilts that were exposed to seeders during a 4‐week period. Gilts were divided into six groups of 10 with different proportions of seeder‐to‐naïve, from 1:9 until 6 seeders and 4 naïve gilts. Naïve gilts were considered positive in the end of exposure if M. hyopneumoniae was detected on bronchial swab or fixed lung tissue, collected at necropsy. As result, 33% (3/9) naïve gilts were positive in the 1:9 ratio, 75% (6/8) in 2:8, 28% (2/7) in 3:7, 33% (2/6) in 4:6, 80% (4/5) in 5:5 and 100% (4/4) in the 6:4 ratio (Figure 1). Six seeder gilts, or actively shedding gilts, were required in a group of 10 for successful exposure to M. hyopneumoniae in a 4‐week period. However, M. hyopneumoniae was detected on laryngeal swabs samples of all naïve gilts in the ratio 5:5, implying that this ratio can possibility be used to achieve exposure of all gilts in the group in a longer period of exposure. This investigation is a first step towards a standard M. hyopneumoniae acclimation protocol. 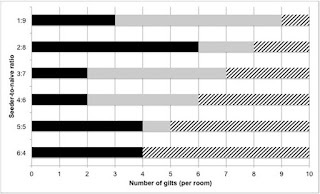 Keywords: gilt acclimation, enzootic pneumonia, seeder‐to‐naïve exposure model.